We provide Accounts Outsourcing Services, Taxation Services, Business Advisory Services for you! 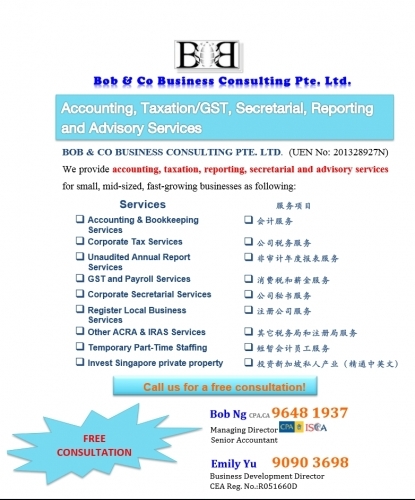 Looking for professional accountants or looking for accounting services? We provide Accounts Outsourcing Services, Taxation Services, Business Advisory Services for you! We have years of experience with small and medium enterprises(SME), and professional practices. Let our experienced team take care of your day-to-day accounting worries so that you can focus on your business. Looking for corporate or personal tax services? We offer services such as Income tax reporting for company and individual, Goods & services tax (GST) reporting, GST registration and Tax planning. We advise our clients on the type of business set up most suited to their needs. We provide incorporation of companies in anywhere in the world, registration of foreign company (branch) and representative office. We, at Bob & Co Business Consulting are an established provider of global business process outsourcing solutions. We offer a comprehensive range of solutions as a one-stop service provider where all your business needs can be met. Let us help you to grow and succeed by giving you insightful advices and providing resources to meet your needs. Check out our services today. Welcome to email or call us for a free quotations or just a chat!